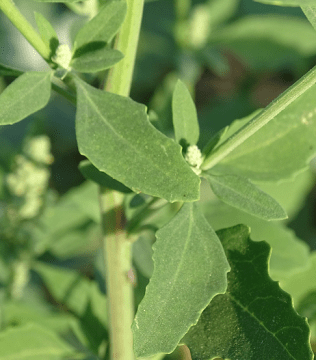 Chenopodium album (Lambsquarters) Bathua – complete detail. 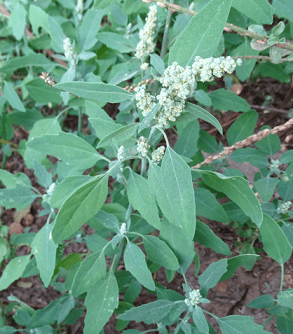 Medicinal uses of chenopodium album (Lambsquarters) Bathua. 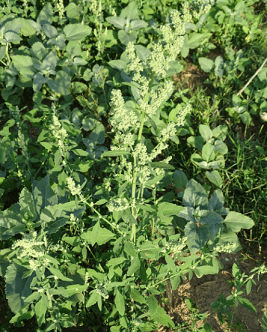 Description of Chenopodium album (Lambsquarters) Bathua. 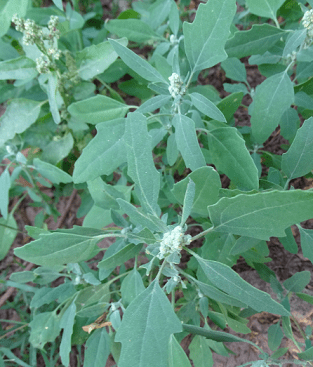 Classification of Chenopodium album (Lambsquarters). It has some medicinal properties like anthelmintic, antiphlogistic, antirheumatic, contraceptive, laxative, odontalgic etc. Local name of Chenopodium album is Bathua. The maximum height is about 5 ft. The entire plant is covered with varying amounts of a waxy substance giving the plant a light green appearance. The flowers are gray to green and are arranged in spikes in the leaf axils at the ends of the branches and stems. Chenopodium album is a fast-growing annual herb. The maximum height is about 5 ft. The entire plant is covered with varying amounts of a waxy substance giving the plant a light green appearance. The branches are angular or ridged, ascending, and usually striped with purple, pink or yellow. Stems ribbed, often tinged with purple or red. The leaves are alternate and can be varied in appearance. The first leaves, near the base of the plant, are toothed and roughly diamond-shaped, 3–8 cm long and 3–7 cm broad. The leaves on the upper part of the flowering stems are entire and lanceolate-rhomboid, 1–5 cm long and 0.4–2 cm broad, they are waxy-coated, unwettable and mealy in appearance, with a whitish coat on the underside. The leaf blades are usually ovate to lanceolate. Leaf surfaces, especially on new growth, are covered with a fine white powdery coating. The flowers are gray to green and are arranged in spikes in the leaf axils at the ends of the branches and stems. Flowers bloom from May through November. Tiny, green, stalk less flowers are packed in dense clusters at the tips of the main stem and branches. The tiny flowers lack petals, and like the leaves, are also covered in a white powdery coating. The seeds are disc shaped with a notch, glossy black, brown or brownish green. The seeds have a thin, papery covering which often persists, giving them a dull appearance. Seed round, flattened with a marginal notch, brownish green to black. Chenopodium album is one of the most widely distributed species of weeds in the world. Commonly found in Australia, India, South Africa, and the Americas. 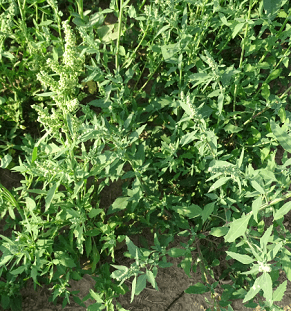 Chenopodium album is also found throughout the United States and is primarily a weed of agronomic and horticultural crops, nurseries, and occasionally pastures. In India, the plant is popularly called Bathua and found abundantly in the winter season. The leaves and young shoots may be eaten as a leaf vegetable. Chenopodium album have some gentle medicinal properties and is a very nutritious and healthy addition to the diet. Chenopodium album has some medicinal properties like anthelmintic, antiphlogistic, antirheumatic, contraceptive, laxative, odontalgic etc. Chenopodium album used in the treatment of rheumatism, bug bites, sunstroke, urinary problems, skin problems etc. The leaves and young shoots of this plant are used in dishes such as soups, curries, and paratha. 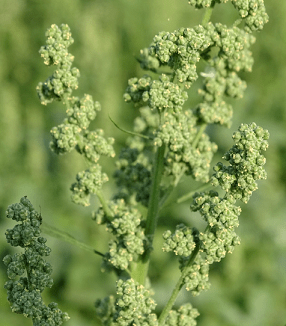 Chenopodium album used to treat various symptoms attributable to nutritional deficiencies. It’s also said to have sedative and refrigerant properties, and people have used the poultice leaves to soothe burns. Many wild birds eat the seeds, as do chipmunks and squirrels, and the plants are used as fodder.